In the space of an hour, one man’s life was irrevocably changed through the introduction of a simple tool. Blind from birth, Katunda shuffled hesitantly into the physiotherapy department on the arm of his helper, but strode out independently using his newly acquired cane. The smile on his face was equally matched by the one worn by Brisbane Physiotherapist Louise Arvier. 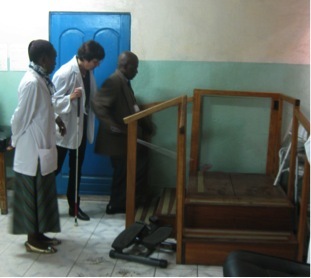 On her first visit to Goma, Louise brought several canes with her and spent time teaching Katunda, his helper and her colleagues at the Heal Africa hospital physio department, how to use the white cane. During the physio session, they practised walking up and down stairs and navigating a variety of pathways. 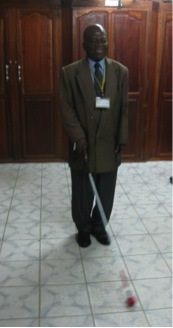 On completion of the session, Katunda, who is president of the Goma Blind Association, was able to navigate his exit from the hospital with minimal aural assistance. This case exemplifies the satisfaction that can be achieved by providing an elegant, simple solution to a complex problem.